Flexible Flyers Rafting has been rowing river trips on the Lower Animas River since 1983 when its founders Robin and Stephen met and began rowing commercial trips. Throughout our 30 years in business Flexible Flyers has stayed with our mission: To provide fun, friendly, family oriented rafting adventures. Our customers become our friends, and they return year after year to raft the Animas River with us. Since Flexible Flyers Rafting as been in business we have sustained the idea of “safety never takes a vacation”- that way, you can relax and enjoy yours. We have a perfect safety record—the best of all the companies on the Animas. All of the guides working for Flexible Flyers Rafting have a minimum of three years guiding experience and are certified in first aid & CPR. Most all of our guides have even more extensive training in courses such as Swift Water Rescue I, II, and III, as well as EMT and Wilderness First Responder. At Flexible Flyers Rafting we love to have fun and we love our days on the river. We look forward to meeting you on the river! 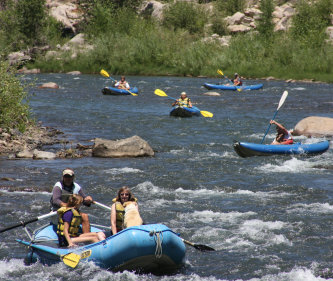 Our full day family trip is 18 miles of beautiful rafting on the Lower Animas River. 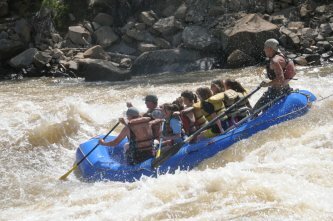 The full day trip offers everything ranging from beautiful, relaxing rafting to thrilling class III rapids. The full day trip starts on the north end of town and flows south through the Southern Ute Indian land before ending 18 miles south of town where we pick you up and shuttle you back to your vehicial. On this trip you get to experience the beauty of Southwestern Colorado and the stunning views of the San Juan Mountains while enjoying being on the river. A day on the Animas always gives you the opportunity to see wildlife such as deer, elk, the occasional bear, and amazing water fowl. On the full day trip we provide a delicious big lunch prepared buy our guides who, during lunch, become chefs! $65 for adults and $50 for 15 and younger. the Piedra River is one of the hidden gems of the Southwest. With continuous class 3+-4+ whitewater rapids you have the thrills of a lifetime on a seldom rafter section of river which is still one of the last free flowing rivers in all of Colorado. As we float down 22 miles of the Piedra River you are looking up at cliff walls exceding 1,000 feet. The Piedra River starts North of Pagosa Springs and flows down approximately 22 miles towards Arboles. Half way through your trip there are natural hot springs we can stop at and soak up the warm water which is a nice change from the chilly water of the Piedra. The Piedra Ricer has a very short season from May to mid June and books up very fast so if you are interested in action packed white water please call us or email us and we would be happy to set up a reservation for you. Cost is 250.00$ per person with at least 4 people going. 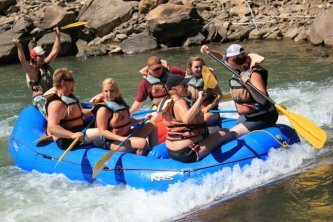 At Flexible Flyers Rafting our guides have a minimum of three years guiding experience, and our average guide at Flexible Flyers Rafting has over ten years of experience guiding rafting trips on all different levels water. All of our guides are certified in the state of Colorado and have been through extensive training through guide schools. We have perfect safety record on the river and plan on keeping it that way. They love to raft, and it shows!